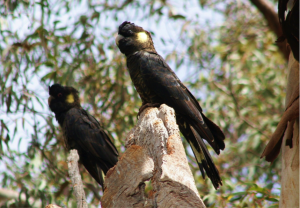 A pair of Yellow-tailed Black Cockatoos, with female in front. Photo: John Spiers. Sightings of small groups of these magnificent birds became increasingly common in suburban and rural areas after they learnt to exploit the cones of exotic pines as a food source. Their distinctive flight silhouette with a large rounded head, deep leisurely wing beats, and echoing “whee-la” calls make them easy to recognise. Although regarded as “Vulnerable”, large flocks of up to 200 birds or more may nevertheless be regularly seen in winter in the Mount Lofty Ranges. Yellow-tailed Black Cockatoo. Photo: Kevin Williams. Yellow-tailed Black Cockatoos feed on seeds and insect larvae. They have learnt to extract seeds from the cones of exotic pines by tearing the cones apart. Larvae are extracted from the stems of trees by using their large bills to tear strips of bark away from the trunk and gauge deep into the wood. Breeding occurs from October to March in South Australia. The nest is a large tree-hollow lined with a bed of woodchips. Two eggs are laid and incubated by the female only. Usually only one chick survives which fledges after 28-29 days and remains with the parents until the next breeding season. Yellow-tailed Black Cockatoos are large cockatoos with a dusky black body. The body feathers are finely edged yellow. The long, tapered tail has a black terminal band and a broad yellow-band with dark brown spots through the mid-tail. The central two tail feathers are black. They have a short crest curving forwards on the head. The feet are grey-brown, and the iris is dark brown. Males and females are similar, but differ in several particulars. The male has a dark grey bill, prominent pink orbital rings around the eyes and the crest curves forward over the bill forming a distinct ‘bob’. The female has a bone-coloured bill, a dark grey orbital ring, a much brighter yellow cheek patch and the yellow tail panels are more heavily vermiculated. Immatures are like adult females. Chicks have a dense yellow down. 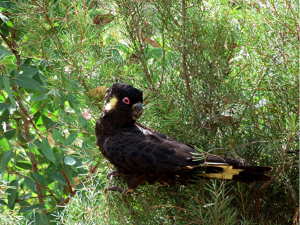 Yellow-tailed Black Cockatoos are moderately common in the mount Lofty Ranges, the southern Murray Mallee, the South-east and on Kangaroo Island. On the Adelaide plains they are uncommon; rare on Eyre Peninsula and only appear as vagrants on Yorke Peninsula and the mid-north. The natural habitat they prefer ranges from coastal heath, woodland and forest but they are increasingly to be found in pine plantations and patches of pine trees in urban and rural areas. They are social and congregate in small flocks. In winter they form large flocks of up to 200 birds which are often seen in the southern Mount Lofty Ranges.